NB – Delaying the dispatch of a voucher will NOT change the expiry date, which is based upon date of purchase. Wander around the Dockside Story in the self-guided part of this tour. Discover fascinating tales about the birth of the whisky industry and Glasgow’s history, featuring live footage and animation bringing history to life. Next, our expert guide will show you around The Clydeside Distillery. Meet our lively craftsmen as they handcraft pure new make spirit using traditional methods and time-honoured skills. Enjoy the spectacular view over the Clyde from our gleaming contemporary Still House. Finally, come to the exclusive Blender’s Room with magnificent views for a mouth-watering, multi-sensory experience. Savour 5 carefully selected 10ml drams of Single Malt Whisky. 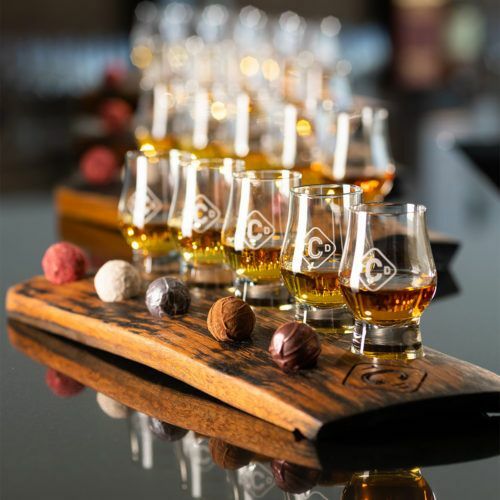 Each dram is perfectly paired with artisan chocolate handcrafted by the renowned Scottish chocolatier, Sugar Wings of Glasgow. The Artisan Chocolate is freshly made every day. The gourmet couverture uses superior cocoa beans and is combined with locally sourced Scottish ingredients to dramatic effect. This gift voucher entitles two people to enjoy a Chocolate and Whisky Tour at The Clydeside Distillery. To book your tour please call 0141 2121 401 or email info@theclydeside.com with your voucher barcode. For more information visit www.theclydeside.com. Gift vouchers are valid for 12 months from the date of purchase.